Words of advice from "Hip Hop's Financial Advisor"
Your Lattes Aren’t The Problem. It’s Time to Make More Money. Stop going out to eat for lunch. Brown bag it! Turn the lights off when you leave the room. Save $1.50 per month! Cut out your daily latte! Now, I know they mean well, bless their little hearts. And while they can be useful to you if you’re in a real cash crunch, those ideas are mostly just rearranging the chairs on the sinking ship. There’s a definite limit to how much you can cut your spending. Sorry, but I just don’t subscribe to that theory. If there’s a certain type of life that you have envisioned for yourself, your job is to figure out how to generate the income that will afford you that lifestyle. See, I’ve seen many people stay in jobs where they are unfulfilled and underpaid simply because they feel as though their current situation is “safer” than looking for a new job or starting a business. However, with technology replacing workers everyday (if a robot can do your job, it soon will) and companies eliminating positions at a breakneck pace, the only “safe” career strategy is to be relentlessly focused on maximizing your income and accumulating multiple streams of revenue. Companies do not exist to make their employees wealthy. You much take the financial well-being of yourself and your family into your own hands. The good thing for you is that while you may find it nearly impossible to save the amount of money you desire to save in your current situation, it’s never been easier in the history of this planet to make more money without needing someone’s permission. Thanks to Al Gore’s invention of the Internet, the doors to more income have been blown open wide enough for you to drive a truck through…or your new 7 series, whatever floats your boat. A few days ago, I landed my very first appearance on the Fox network and I was honored to be able to use that platform to provide some of my best ideas on how to make more money in the new year. Seriously, if you need extra money and you have a vehicle, why wouldn’t you drive for Uber or Lyft? 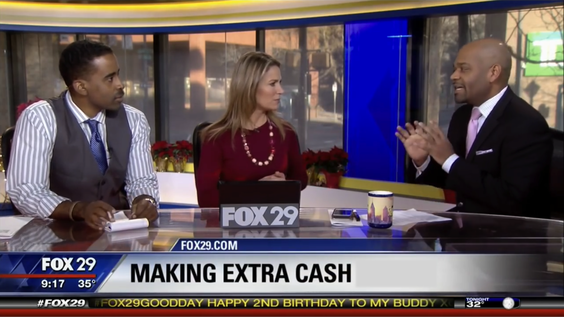 Check out the video of my recent appearance on Fox’s #GoodDayPhiladelphia to get even more tips and resources on dramatically increasing your income this year. Most people that I come into contact with, even those with a “high salary,” just aren’t being paid what they’re worth. Fortunately, that is not a situation that you have to stand for any longer. If you’re going to make any resolutions this year, I’d suggest that you resolve to improve your financial life by making more money. A speed boat will help your reach the island much faster than a neatly aligned deck chair on the Titanic. Get more like it by subscribing for weekly updates from yours truly. Sign up here to get weekly updates with intelligent financial advice. Are You Playing the Wrong Game? What If The Thing Holding You Back Is…You? If you're finally ready to get your finances in order so that you can build real wealth and live the life of your dreams, this is the site for you. I help young professionals learn how to make more money, spend more wisely, and invest more efficiently.